What a performer, well worth going to see and i will definitely be going to see him again! My favourite Venue, and a great evenings entertainment. Really enjoyed the gig as always. Adam always does a great show and his band of musicians are excellent. Enjoyed the set with all the crowd pleasers well staged - as Adam said " his Christmas present to us" and we loved it!! Have enjoyed these Christmas gigs at the Roundhouse every year since they started and hope they continue, but can you consider a different venue occasionally, although I like the Roundhouse itself it is trickier to get to and takes a long journey, as the tubes are subject to problems and no parking etc. I've seen Adam twice now and his live performances are extraordinary. He is a mix of raw sexuality, vulnerability and a dynamism beyond his years. Fantastic night in an iconic venue. The untameable Adam Ant is once again about to explode onto the wild frontier of the stage. Extravagant, enigmatic and enrapturing, the extrovert new wave legend with erupting charisma is never found without his signature flair for dramatic costume and certainly lives by his own motto: “Ridicule is nothing to be scared of”. The irrepressible pop prince stole the hearts of legions of ant army fans throughout the eighties with ten Top 10 singles, three of which rose to #1, and through his continuing work as an actor on film and television. Now, Adam is back by popular demand to play a huge tour which takes him to Sheffield City Hall, Edinburgh Usher Hall, Royal Covert Hall at Glasgow, Middlesbrough Town Hall and Cambridge Corn Exchange in November. Then Margate’s Winter Gardens and O2 Academy Brixton in London during December 2019. Adam Ant tickets can be yours from 10:00 on Friday 8th of March. You can set your very own personal reminder through Gigantic. making you ready for their upcoming release. Before becoming one of the most easily recognised pop icons of all time, Stuart Godard embarked on his musical career with the pub rock band Bazooka Joe. As pub rock became eclipsed by the rise of the punk movement in the late seventies, he adopted his now familiar stage name and started the band Adam And The Ants. But his vision went far beyond the dead-end nihilism of punk and predicted the oncoming decadence and imagination that would characterise the eighties. The records Kings Of The Wild Frontier (1980) and Prince Charming (1981) would exhibit a flamboyance that went far beyond all that had preceded it, and with songs that actively recruited fans to join what would become the New Romantic movement Adam And The Ants would become a definitive part of pop history. So be ready to unplug the jukebox one more time when Prince Charming hits the road once more. 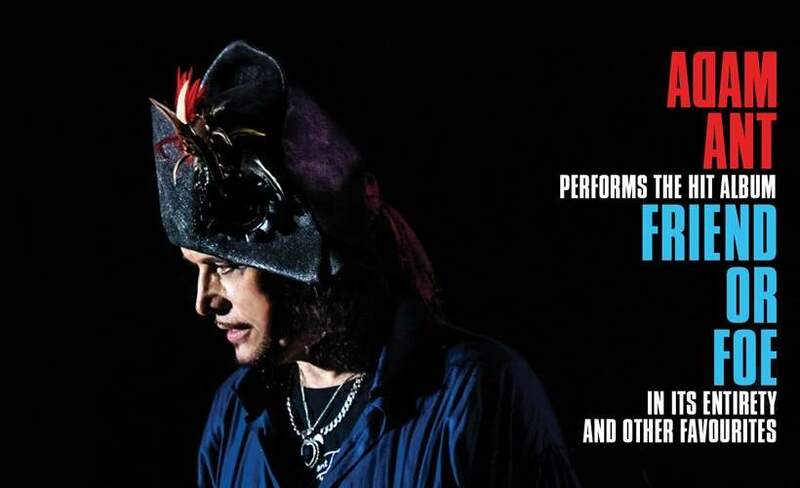 Adam Ant tickets are the perfect present for Mother's Day. Christina Aguilera, Pete Tong, Adam Ant, Madness plus much more!